For 30 years, Creative Dimensions has designed studio sets, broadcast signage, trade-show exhibits, and more. Its wide range of expertise goes hand in hand with a long history of understanding the most recent technologies and design trends used to captivate viewers. And 30 years of experience means the team understands what Creative Dimensions is not. 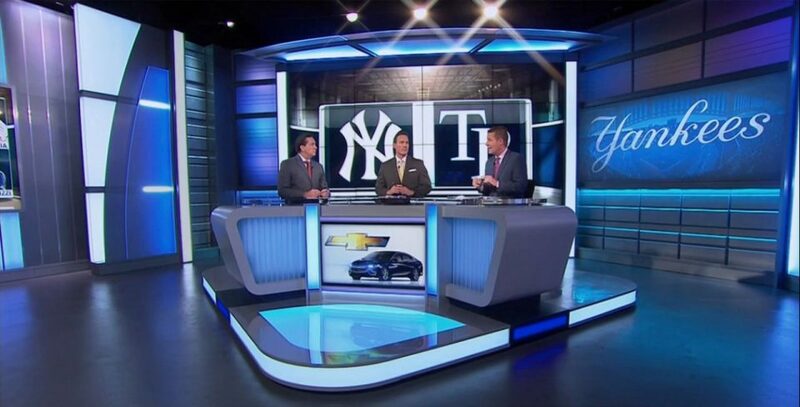 Creative Dimensions takes a bespoke approach toward studio design that leaves clients like the YES Network happy. Clients include the USGA, the American Athletic Association, ESPN, MSG, YES Network, Spectrum SportsNet LA, and the NFL’s Indianapolis Colts and Baltimore Ravens. Some of them want fancy sets with LED screens while others want a simple bistro table that the announcers stand around rather than sitting at. And clients take advantage of the company’s VERSA Broadcast Desks, a customizable, lightweight, and portable remote desk that can be assembled and taken down without tools. Coupled with a rolling crate that can house stools, it gives the production team a simple and flexible way to take the show on the road. One of the challenges for Creative Dimensions (and nearly anyone involved in the design business) is that often the conversation begins with the directors and operators, who ultimately do not write the check. A design is agreed on, but then those who write the checks begin to get involved, which leads to revisions to make the design fit the budget. A bit of advice: to keep everyone happy and moving as efficiently as possible toward the goal, have the budget agreed on before design work begins. Video walls, for example, are often considered a must-have, but they can throw off a budget to the point where the decision is either go with the video wall or give the set a new look. Roy says the strength of the Creative Dimensions team is its relationships with its clients and ability to listen and come up with a solution that works.